With the weather in the Cape Winelands being on the chilly side at the moment, it’s time to knock out some hearty weekend brunches. Our Big Dog Café has you covered with this decadent and earthy Beans on Toast dish. 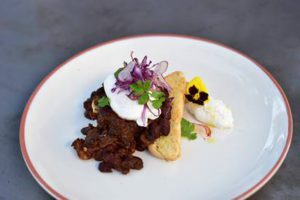 An easy crowd pleaser to share with friends and family, this dish has all the depth of espresso, dark chocolate and some warmth from exotic Mexican ancho chili. Toast the seeds in a hot, dry pan until darker and fragrant. Allow to cool and grind to a fine powder in a mortar and pestle or use a spice grinder. Keep the leftovers for next time. Soak the ancho chili in half a cup of hot water until soft. Reserve the water and chop the chili finely. Place a medium heavy based sauce pan on a medium heat, fry the bacon until the fat is rendered then remove the bacon leaving the fat in the pan. Add the garlic and onion to the pan and sweat slowly with the spice mix until beginning to turn golden. Return the bacon to the pan along with the chili and the tomato paste and sugar, fry for 2 minutes. Strain and rinse the beans and add them to the pan followed by the espresso, chopped dark chocolate and the water from soaking the chili. Simmer the casserole for 20-25 minutes. Finish the beans with seasoning, lemon juice and some chopped fresh coriander. Serve a generous spoonful of the beans on toasted sourdough, top with a poached egg, a dollop of sour cream and some more coriander. For a real Mexican inspired feast, serve with a delicious cold brew mojito.